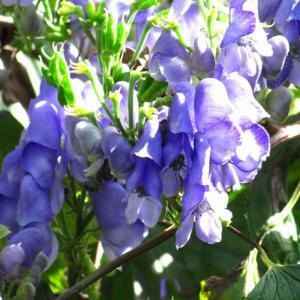 Aconitum hemsleyanum is a very unusual deciduous, herbaceous perennial with a climbing habit. It has attractive glossy dark green maple like leaves, deeply lobed with up to 7 segments and up to 12cm deep and 13cm across. Its stems are twining which enables this plant to climb. 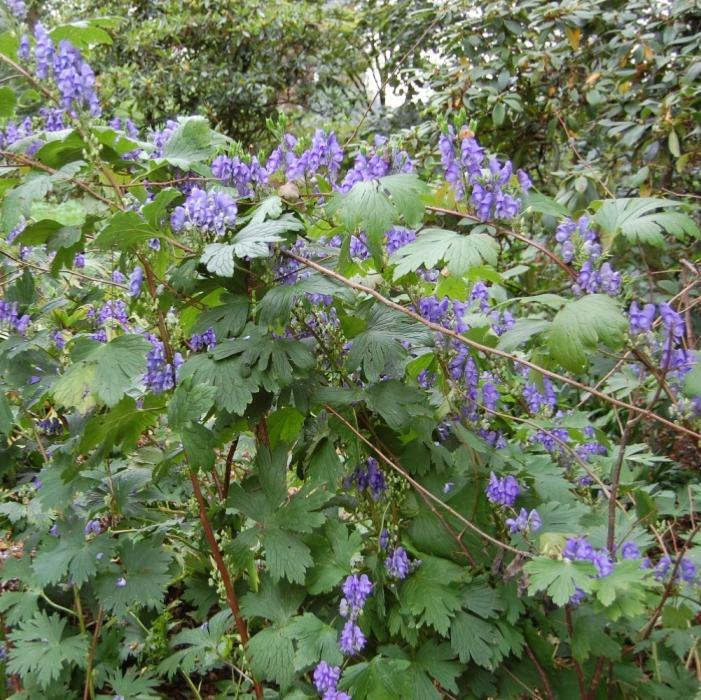 Its dark violet/ blue flowers are hood shaped, up to 2cm tall and suddenly appear in clusters of up to 12 during late summer and autumn. The species Aconitum hemsleyanum, commonly called Climbing Monkshood, can be found growing wild in eastern and central China. In its native habitat it grows mostly at woodland margins. Gardeners will find Aconitum hemsleyanum very useful as a relatively low growing climbing plant with blue flowers in early autumn that can enliven a shrub which has already done its thing, or grown as a standalone specimen with trellis support.Aconitum hemsleyanum flowers are attractive to pollinating insects, especially as it is so late flowering. Climbing Monkshood prefers moist, fertile, well-drained soils and requires little maintenance. To keep a tidy appearance all old growth stems may be removed in spring, as it dies back into the ground in winter. Aconitum is the ancient Greek name for this plant and is loosely translated as ‘unconquerable poison’. Hemsleyanum is named after William Hemsley (1843 –1924), an English botanist. As with all Monkshood, all parts of this plant are toxic, and whilst not generally toxic unless consumed, care should be taken when locating this plant due to its poisonous nature.